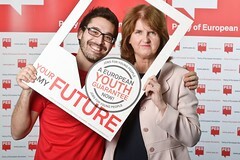 Ireland at Your future is my future - a European Youth Guarantee now! Labour’s MEP for Dublin, Emer Costello, has called for ‘parity of esteem’ for vocational education to encourage young people follow career paths that will lead to employment. She has also called on the European Commission to publish their proposals for Quality Framework for Traineeships agreed at European level to ensure that young people acquire high-quality work experience under safe conditions and to guard against exploitation. Ms Costello was speaking at a conference on the delivery of a "European Youth Guarantee" in Swords on October 11th. Labour MEP Emer Costello, has said that €40 to €50 million of the €150 million expected to be ring-fenced for the Youth Guarantee in Ireland should be poured into communities around Dublin where youth unemployment is worst. Thanks to you the Youth Guarantee is now on top of the EU agenda! Thanks to your mobilization and to the tireless action of the Party of European Socialists (PES), PES Women and Young European Socialists, the European Youth Guarantee is now closer than ever to become a reality. In the last weeks, our joint action was decisive in making sure that EU leaders give a chance to young people all over Europe. During the PES Council on 22 June, party leaders launched an urgent and strong appeal to increase the speed and substance of the European Youth Guarantee (EYG). Following this political pressure, another key event was the PES Social Affairs Ministers’ meeting that took place in Berlin on 3 July. The Ministers were joined by German Social Democratic Party (SPD) candidate for Chancellor, Peer Steinbrück and together they issued a strong call to speed up EU efforts to overcome youth unemployment. In Ireland Minister Joan Burton, Emer Costello MEP and Deputy John Lyons marked the announcement of funding for a year-long pilot Youth Guarantee project in Ballymun. Ballymun was selected as one of the first Youth Guarantee schemes to proceed in the EU following funding approval by the European Commission and the Irish Government. We are closer and closer to have a Youth Guarantee implemented in Europe but, together, we need to keep the momentum going. We invite you to join the campaign, organize and join events in your region and spread the word to your family and friends. Remember, your support is key to tackle youth unemployment in Europe! Speaking to European Commissioner Lászlo Andor at a meeting today in Dublin Castle on Youth Unemployment – An EU Challenge - Deputy John Lyons has stressed the urgent need for a decision on the Ballymun pilot Youth Guarantee scheme. “Last October, an application for European Commission funding was submitted for Ballymun to be a year-long pilot Youth Guarantee scheme. Should the application be approved, it would guarantee any young person in Ballymun under 25 who now finds themselves out of work or education for 4 months, a training or education placement. Dublin MEP, Emer Costello, has welcomed the European Parliament's proposal to extend the scope European Youth Guarantee, to include thousands more unemployed young people. “The Employment and Social Affairs Committee of the European Parliament has recommended that those eligible for the Youth Guarantee be extended from those under 25 years of age, to those under 30 years of age, which would qualify thousands more Irish people for the scheme. Dublin Labour MEP Emer Costello has urged the Irish Presidency to prioritise the adoption of the EU draft regulation*, published earlier, to establish a €6 billion 'Youth Employment Initiative' before the end of its term of office on 30 June. Speaking from this week's European Parliament Plenary Session in Strasbourg, Emer Costello MEP, a member of the European Parliament's Employment Committee said: "The Government has rightly made youth unemployment a key priority of Ireland's EU presidency and has already made good progress on this front, especially in brokering agreement on the European Youth Guarantee in late February. I would now urge it to prioritise the adoption of the new proposal to establish a European Youth Employment Initiative before the end of its term of office in June. Once implemented, the Guarantee will assure young people under the age of 25 a good quality offer of employment, continued education, an apprenticeship or a traineeship within four months of becoming unemployed. “Youth unemployment has reached crisis levels in Europe and today’s agreement is a crucial step in tackling the crisis,” Minister Burton said. Dublin Labour MEP, Emer Costello, has welcomed this morning's decision by EU Social Affairs Ministers to establish Youth Guarantee schemes, to be backed up by dedicated EU funds, in Ireland and all Member States.